Carrying premium design features is always welcome for any dual-SIM smartphone out there, but the HTC Desire 600 dual sim isn’t just for show. Its main purpose is to be available when needed especially considering its call for double duty. At first glance the dual-SIM droid from HTC doesn’t seem likely to impress here, as it packs a relatively modest 1860mAh battery. Hopefully, HTC has done the necessary Android and Sense 5 UI optimizations to make the most out of the available juice. 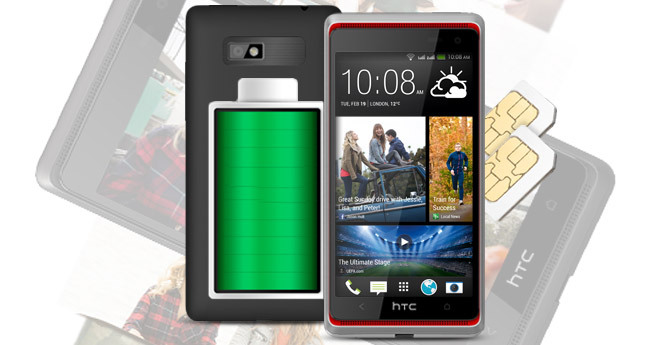 To make sure that the HTC Desire 600 dual sim is as long-lasting as possible when it comes to battery consumption, the company has chosen the low-power Snapdragon 200 chipset with a quad-core Cortex-A5 CPU to power it. Mind you, the additional SIM card slot might also take its toll on the phone’s endurance if the modem isn’t effecienct. Starting off with talk time, the HTC Desire 600 dual sim managed just below 12 hours with one SIM card placing the call, and the other being on stand-by. It’s a decent result for sure, considering that this test is mostly about battery capacity (screen is switched off and the chipset is idle). The results of the HTC Desire 600 dual sim web browsing test weren’t nearly as good. At 6 hours and 34 minutes, the smartphone places around the middle of our charts. The Snapdragon 200 chip and the 4.5″ LCD screen didn’t prove a particularly efficient combo here. Finally, there’s the video playback. Here, the Desire 600 dual sim has every reason to perform well, considering its lower resolution display. However, the Adreno 203 GPU inside the Snapdragon 200 worked overtime and pushed the Desire 600 dual sim 10 minutes short of the 7 hours mark before the phone reached 10% of its battery capacity. That’s not a bad showing, but it’s not record-breaking either. Despite its shortcomings when faced with heavier load, the Snapdragon 200 chipset demonstrated impressive stand-by efficiency. 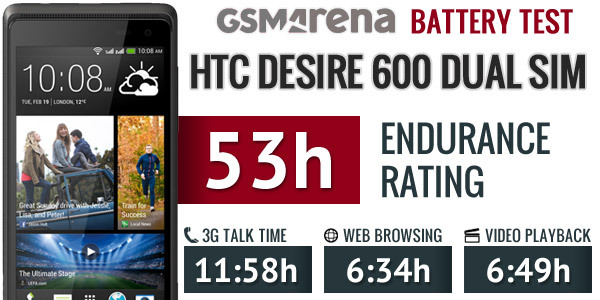 As a result, the Desire 600 dual sim got an endurance rating of 53h. This means that you will need to charge the phone every 53 hours if you do an hour of the three activities tested above every day. If you don’t watch much video and don’t get carried away with web browsing, then you should get a pretty decent run with the Desire 600 dual sim.